A Virginia middle school Rubik’s Cube team solved 25 puzzles in 96 seconds at the DC Metro Rubik’s Cube Challenge. The team from Longfellow Middle School in Falls Church, Virginia, ranks No. 1 nationally for grades 6-8. "We're all competitive against each other, and so it helps when you're trying to get a faster time against other people, it helps get a faster time for the whole group," said Michael Fatemi, who ranks No. 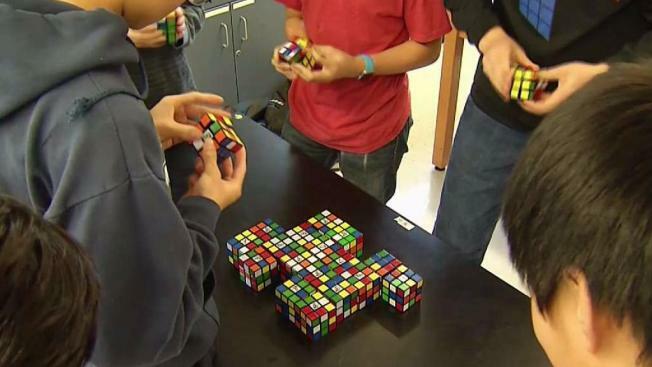 1 nationally among middle school students by You CAN Do the Rubik’s Cube. During the solo competition of the challenge, Fatemi and teammate Justin Choi solved cubes in 12.6 and 15.1 seconds, respectively. They rank first and second among middle school students in the commonwealth. "It's more a muscle memory, so you don’t think the algorithms through, you just kind of do them," Fatemi said. "When you're looking at the cube, you’re just looking for the first couple of pieces to put in the right place, and then we solve it from there,” Choi said. Choi said his fastest time is 7.7 seconds. Fatemi said he has done it in 4.59 seconds. "People think it's pretty much impossible, but after some practice, you can do it in like two minutes," Choi said. A robot set the world record for solving a Rubik’s Cube in 0.887 seconds.